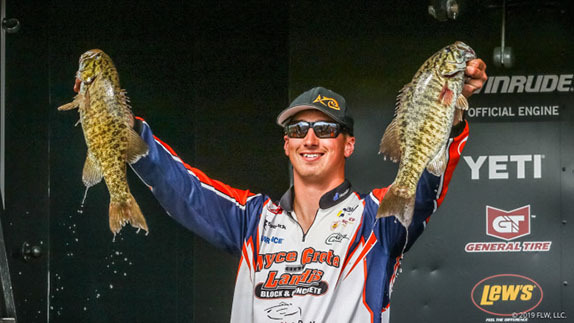 Stetson Blaylock had a big weekend, catching more than 19 pounds in each of the final two rounds. 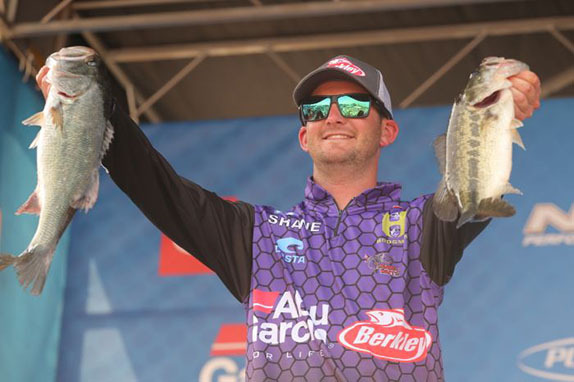 Of the 80 fish that the 2nd- through 5th-place finishers at the Lake Hartwell Bassmaster took to the weigh-in stage in Anderson, S.C., 64 were being looked at before they were cast to. There were lots of other ways to catch 2 1/2-pounders, but sight-fishing was the ticket to capturing the larger specimens that resulted in bags exceeding 15 pounds. Here are some of the specifics from the event for the four anglers who finished closest to winner Brandon Cobb. 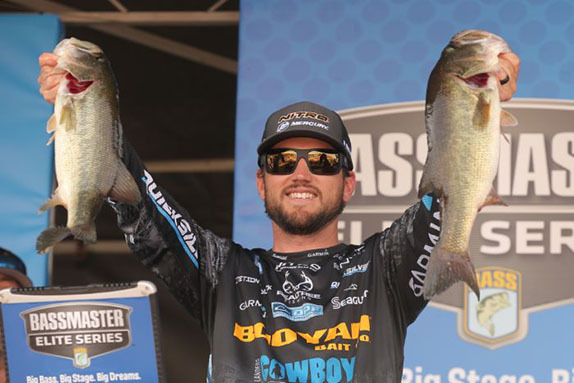 Stetson Blaylock had a lackluster day 1, but picked up the pace the following day and then crushed it on the weekend as he weighed more than 19 pounds in each of the final two rounds. He competed at Hartwell on multiple occasions during his FLW Tour days and arrived with a preconceived notion that he'd be looking for bass on beds the vast majority of the time. "I'd made up my mind coming over that that's what kind of tournament it was going to be," he said. "It didn't really unfold like that until (day 1) � there were a few more fish coming up each day. "I think the biggest key for me was just knowing what time of year it was and knowing what was happening. If the fish weren't on the beds, they'd be coming quick. With nice, warm days, there was nothing for the ones that weren't already up to do. I made the decision to (sight-fish) with the idea that it was going to keep getting better and I'd keep my head down and try to run into the right ones every day." He caught most of his big final-day bag blind-casting as the ones he looked at early in the day weren't as willing to bite a bait twitched around on their nests. > Sight-fishing gear: 7'4" 13 Fishing Envy Black Series rod, prototype 13 Fishing casting reel (8.1:1 ratio), 20-pound Seaguar InvizX fluorocarbon line, 7/16-ounce tungsten weight, 3/0 Gamakatsu G-Finesse hook, YUM Christie Craw (white). > He caught a 4 3/4-pounder on day 4 on a Booyah Poppin' Pad Crasher frog (sunburn). A YUM Finesse Worm, YUM Dinger and an original Rebel Pop-R P70 also produced quality bites. > When asked the color of his Pop-R, he said, "I'd call it 'abused.' It was one of the first ones I got when I started fishing. It started out chrome with a black back, but there's not much chrome left. I guess you'd call it 'bone' underneath." Micah Frazier spent the entire tournament among the top 3 in the standings. 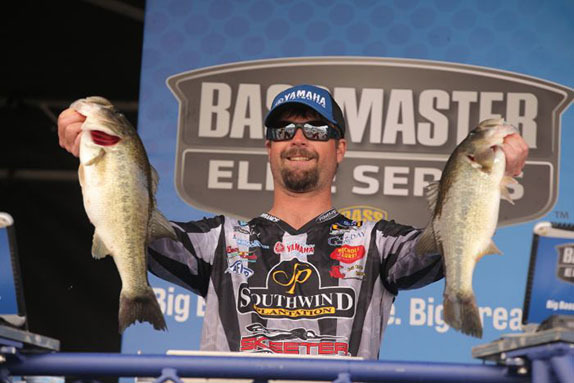 Micah Frazier spent much of his practice time trying to get on a pre-spawn pattern centered around docks. "I couldn't really figure that deal out," he said. 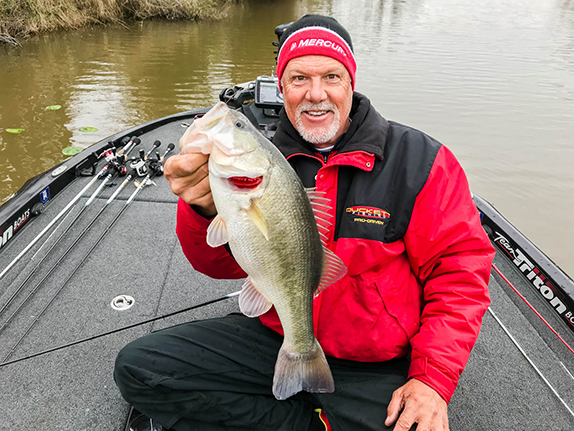 "I threw a topwater some and did a lot of moving around, looking at (water) temperatures and trying to get a gauge on which area of the lake was going to be the best. He switched to primarily sight-fishing as more and more fish came to the shallows as the tournament got under way. He spent the first three days up the Seneca River, catching strong bags on the first two and returning with a mediocre haul on day 3. With his best area pretty much fished out, he went toward the dam on day 4 to a place that has traditionally been plentiful at certain junctures of the spawn. It wasn't as good as he'd hoped it would be, but gave him enough to remain among the top 3, where he'd been the entire event. "The biggest thing or me was just not getting stuck in one area, but moving around a lot," he said. "After not seeing anything I really liked in practice, at 10 o'clock on the first day of the tournament I went somewhere that I hadn't practiced. It was a place where I caught a lot of fish in the Classic last year." He estimated that 15 of his fish came via the looking route, for which he employed a YUM Christie Craw, a YUM Dinger and a YUM Finesse Worm. The Dinger also enticed a couple of good bites from docks and he caught fish blind-casting the worm in extremely shallow water. One weigh-in fish fell for a wakebait. > Casting gear: 7'3" medium-heavy prototype Abu Garcia Veracity rod, Abu Garcia Revo Al-F reel (8:1 ratio), 16- or 20-pound Sunline Shooter fluorocarbon line, 3/8-ounce Swagger tungsten weight, 2/0 worm hook, YUM Christie Craw (white). > He wacky-rigged the Dinger (green-pumpkin) with no weight on a 2/0 dropshot hook. > Spinning gear: 7' medium-action Abu Garcia Fantasista Premier rod, Revo MG Extreme reel, 8-pound Sunline Shooter fluorocarbon, 2/0 dropshot hook, YUM Finesse Worm (green-pumpkin). 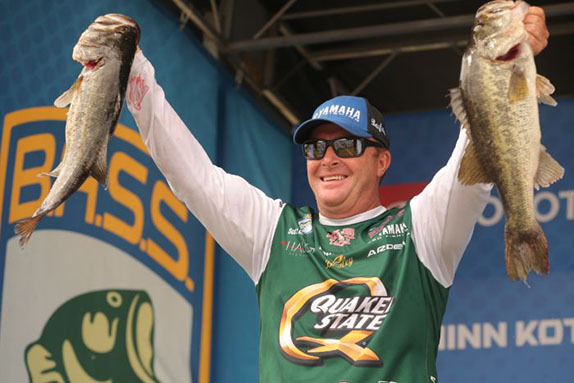 Drew Cook's 4th-place finish put him atop the Angler of the Year standings. Drew Cook, the rookie from Florida who sits atop the Angler of the Year race, sight-fished for 18 of the bass that he took to the scale. The other two came on a wacky-rigged worm. "I knew what I was going to do 10 minutes into the first day of practice," he said. "I found some stuff (on a pre-practice trip) up in the muddy water and I kind of thought maybe I'd do that the first day and just burn it up, and then go to the (main) lake and sight-fish. The muddy water was colder, though, and I just couldn't get bit in it." He'd marked five bedding fish that he'd planned to catch on day 1 � two big females and a trio of 3- to 4-pound males. However, the water level had dropped a couple of inches when he arrived and all were gone." He had some 3-pounderss pinned down in deeper water that he was forced to resort to, and then he was forced to find new ones from there on. He did a stellar job of that on day 2 as he weighed a 20-06 stringer that was the biggest of the tournament. All five fish were nearly identical in size � the biggest registered 4-11. "The strategy played out pretty well and I ended up in a good area where I caught them on the second and third days. During practice, those fish weren't spawning yet � they were cruising around and I think that caused a lot of people to overlook them. I never saw a boat on the second day and that was definitely one of the main keys for me." He had a difficult day 4 as he managed to catch just one of the four bedding females he worked on. He said none of the three he failed to convert on was under 4 3/4 pounds and the biggest one was over 6. He hooked and lost the latter fish twice. > Sight-fishing gear: 7'4" medium-heavy Dobyns Champion XD rod, Shimano Curado casting reel (8.2:1 ratio), 20-pound Seaguar InvizX fluorocarbon line, 1/4-ounce tungsten weight, 4/0 Gamakatsu G Series Heavy Cover hook, Big Bite Baits Fightin' Frog (tilapia magic). > The bait for his wacky rig was a 5" Big Bite Baits Trick Stick (tilapia). 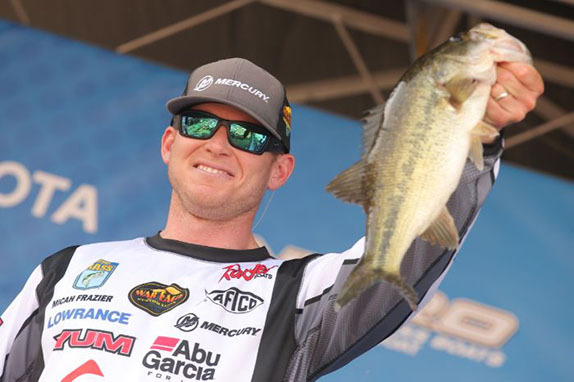 Shane Lehew climbed into contention with a 19 1/2-pound bag on day 3. Shane Lehew jumped from 22nd place to 6th with a big day 3 and gained one more spot in the final round to log his second top-5 as a pro (he was 4th at the Harris Chain FLW Tour in 2017). He pulled 15 of his weigh-in fish from the beds, caught a few from docks with a wacky rig and enticed a couple with a buzzbait. He burned up all the marked fish he had on his big-weight day and had to scramble to find new ones in the final round. He passed on a lot of 2 1/2-pounders in search of bigger specimens that would allow him to make another upward move in the standings and found a couple, but they weren't ready to cooperate. "I was constantly covering new water and going into new pockets and fishing fast. Even fishing docks, I'd make two or three skips and that was it. "I had my trolling motor on about 7 the whole time and I was pretty much standing on it. When I found one, I'd turn around and try to catch it." > Sight-fishing gear: 7' medium-heavy Abu Garcia Veracity rod, Abu Garcia Revo STX casting reel, 15-pound Berkley Trilene 100% Fluorocarbon line, 3/0 Berkley Fusion 19 Heavy Cover hook, 4" Berkley PowerBait Power Lizard (green-pumpkin or watermelon red). > His wacky-rig bait was a 4" Berkley PowrBait MaxScent The General (baby bass). > His buzzbait was a Greenfish Tackle Toad Toter model with a white toad attached.